← Congrats Emily-you’re going to the fair! The cheese fair I mean. 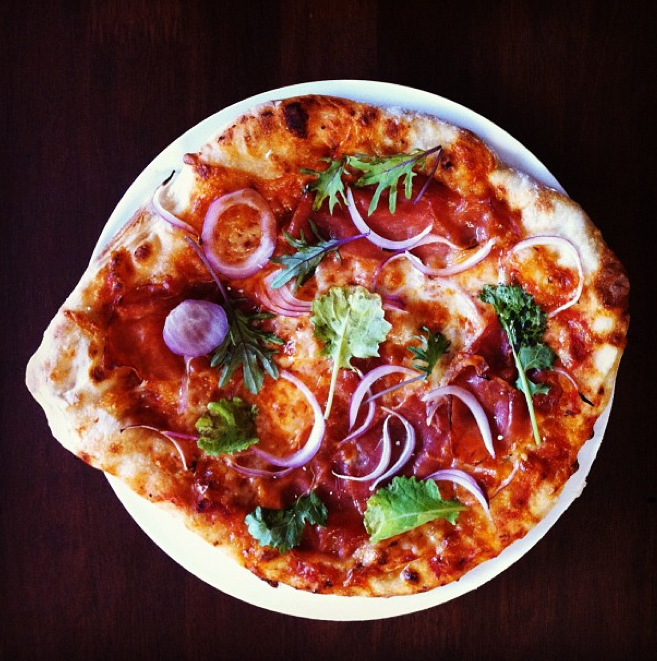 When the moon hits your eye like a no knead pizza pie…. 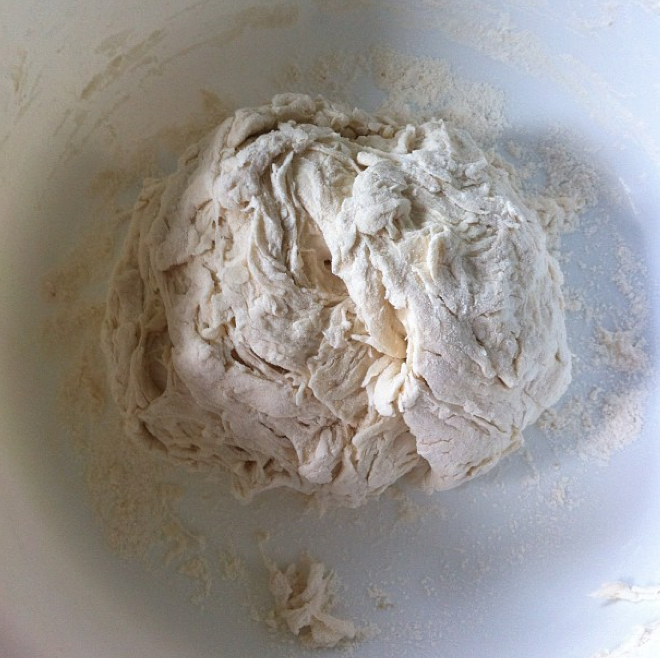 No knead pizza dough was a revelation and a roaring success—say I, the only one eating the hot pizza yesterday afternoon at 1pm. A lone witness to my own spectacular creation. But it really was amazing, the crust was flavourful (the point of the 18 hour ferment) and chewy on the inside, but crisp on the exterior. And I didn’t even use a pizza stone, mine cracked a while back and I have yet to replace it, but now I want to replace it ASAP. So much pizza potential in my future! 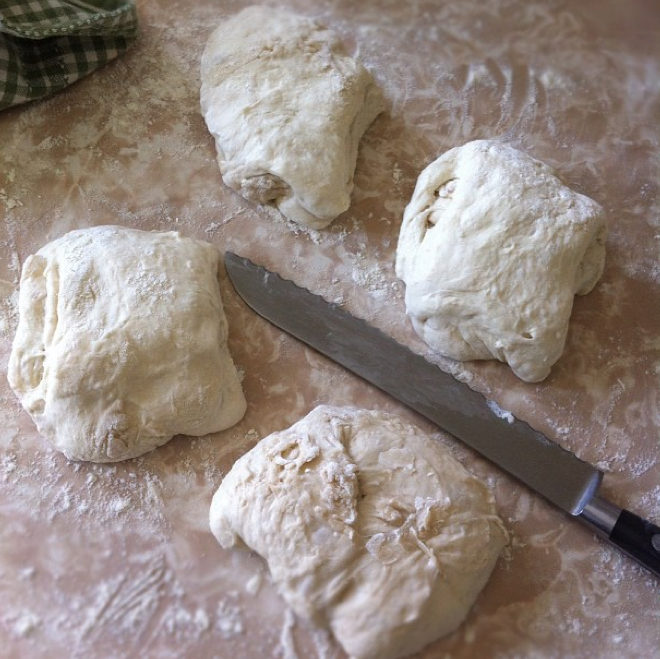 For some background, here is a good piece on the no-knead recipe (with a video) created by Jim Lahey. 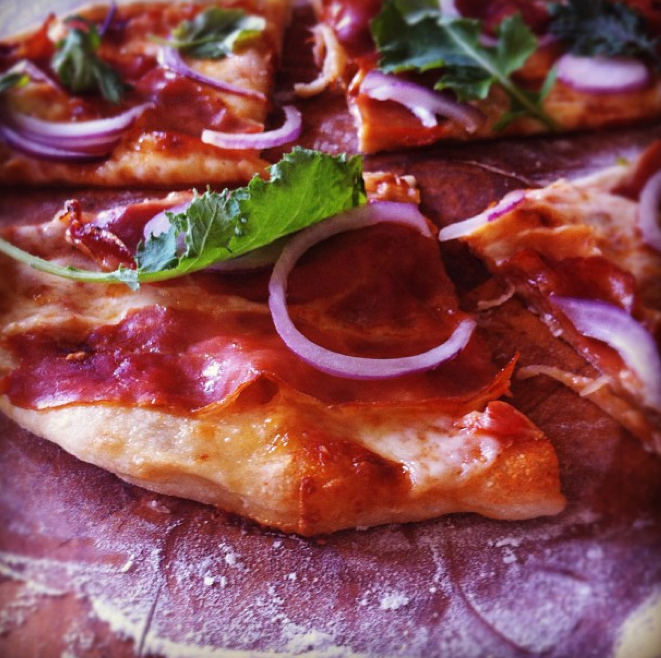 You must try this pizza dough at least once. 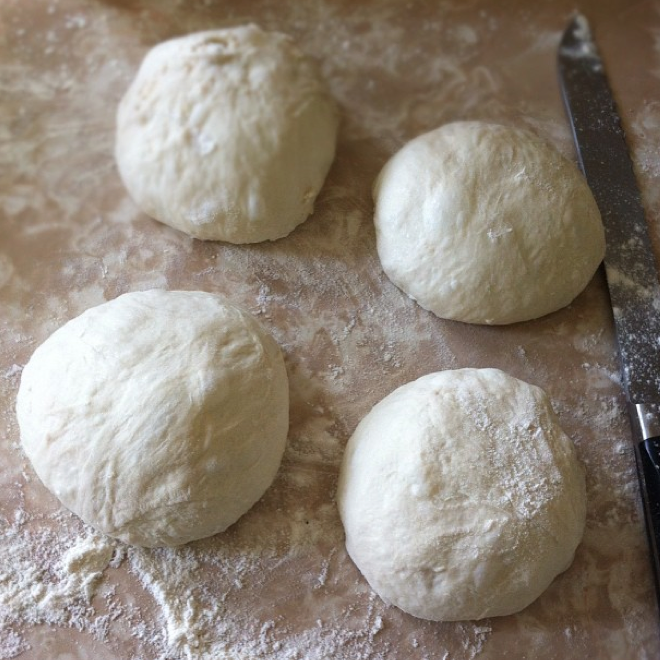 Throwing the dough together takes about 45 seconds (give or take a minute) and after an overnight ferment you can have pizza on the table way sooner than delivery can get to you. Sooner than you can bake a frozen pizza in fact. And waaaaaaaaaaay better. 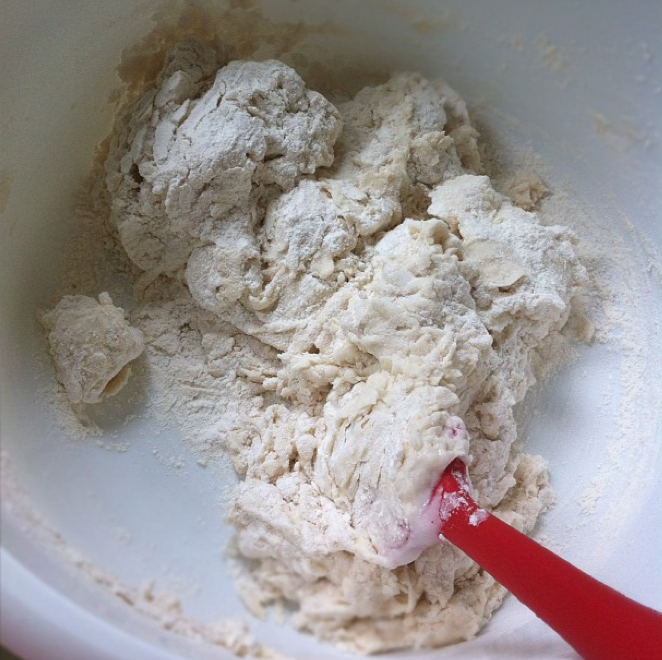 Ina large bowl mix 500g AP flour (3 3/4 cups), 1 gram active dry yeast (1/4 tsp), 16 grams fine sea salt (2 tsp). Now add 350g water (1 1/2 cups). 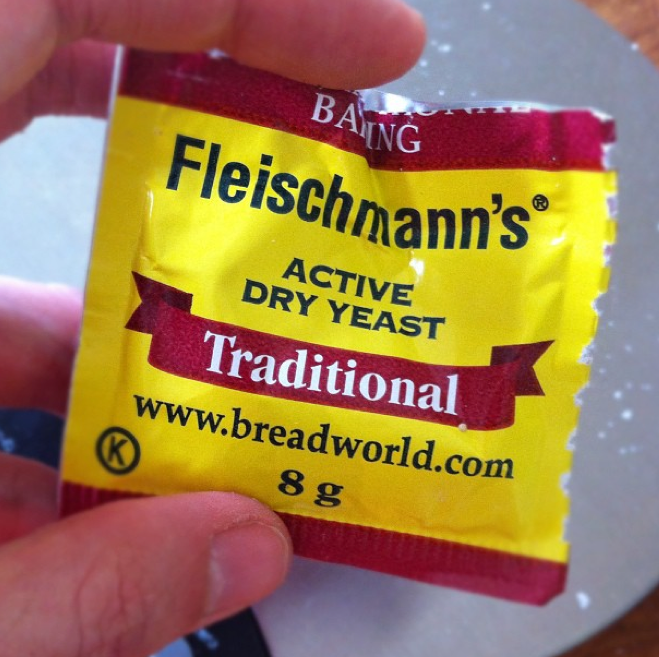 *make sure you have the right yeast–not instant and not pizza yeast. Mix everything with a spatula til the dough comes together and then use your hands to pick up any excess flour with the still sticky parts of the dough. I ended up with the above. 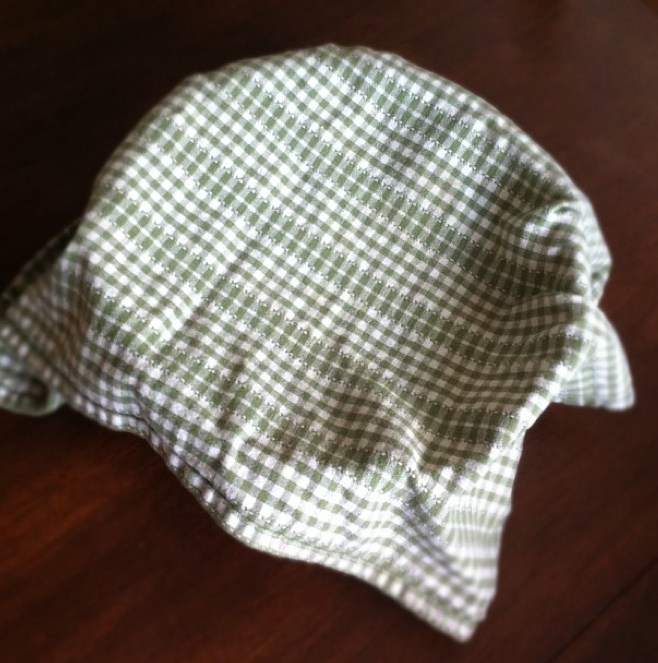 And then I threw a tea towel over it (or just use saran wrap) and let it sit in a warm part of the house for 18 hours. And that part is done. See? Easy–I barely had enough instructions to go with the pictures. 18 hours later it should have doubled. (Mine also kind of “splatted” a bit. Made itself comfortable in the bowl. ) The “doubling” may go slower in a cooler room and faster in a warmer one. Until you have something like the above. 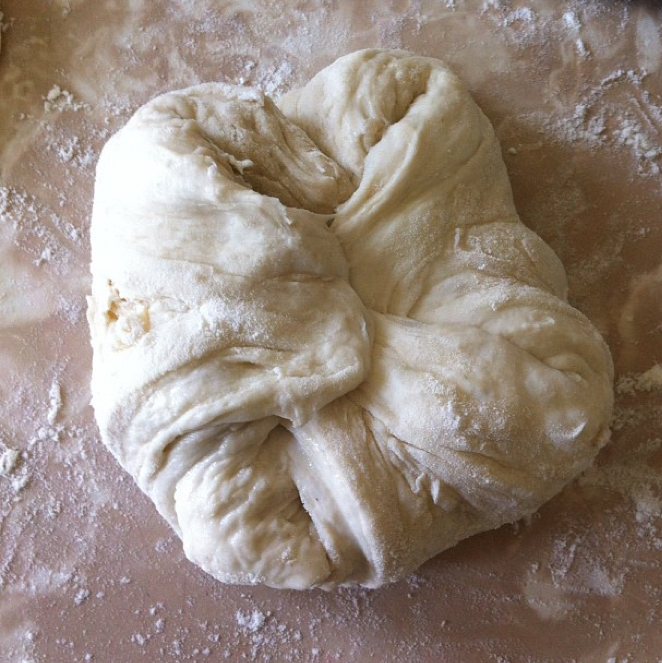 Then flip your dough over, seam on the bottom, and using your hands mold the dough into a neat ball. And you will end up with something very satisfactory, like the above. 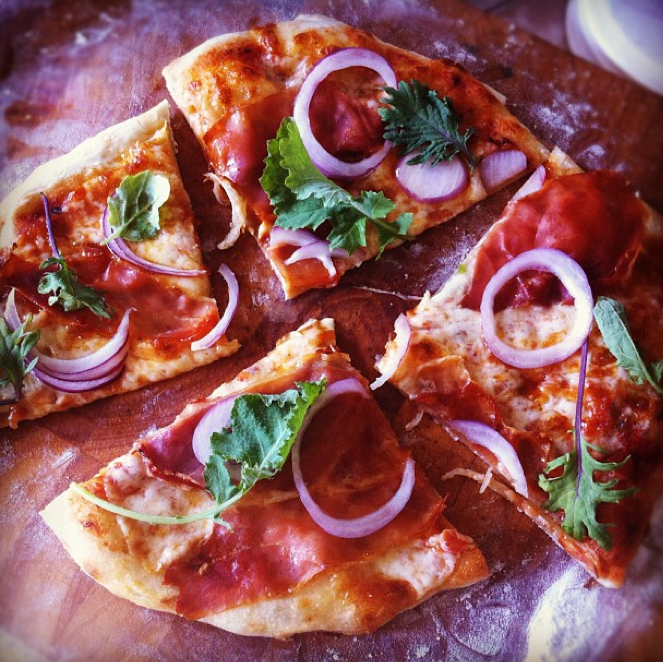 The dough will feel loose and silky in your hands, it is less stiff than other pizza dough recipes sometimes are. Since I was not ready to make my pizza, I saran-wrapped my dough balls and put them in the fridge. They can sit for up to three days. You bring the dough out of the fridge a couple hours before you want to use it. Just to get it to room temperature. (Yes, I probably could have used a bigger plate.) 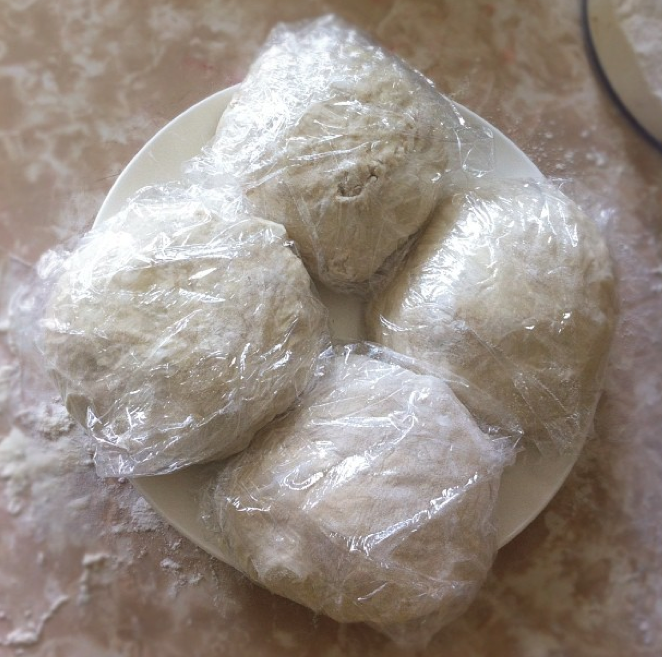 Also, my dough was a bit damp under the saran wrap, so I just dusted it with a bit of flour once out of the wrap. Then covered with a tea towel and let warm up. Let’s summarize: on your actual pizza making day all you have to 1. take dough out of the fridge and 2. form it into a pizza. Also preheat the oven to 500°F. The forming is the fun part. 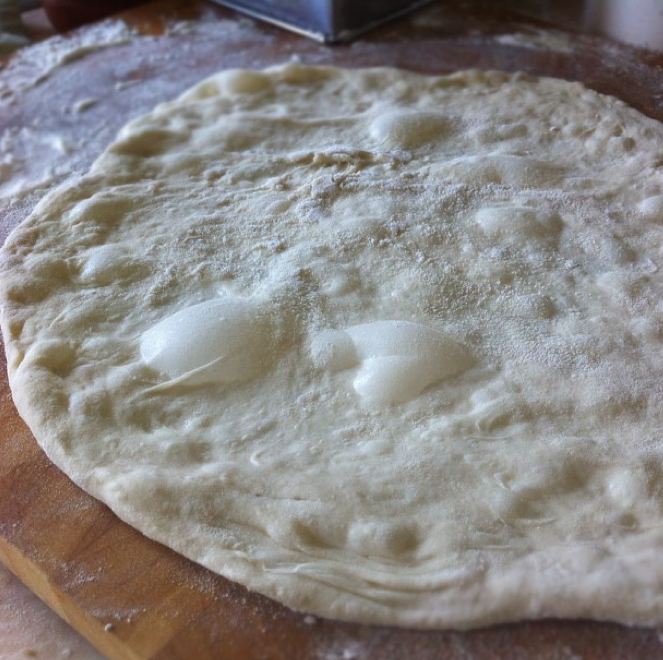 Handle the dough very gently–you want some of the gas/bubbles to remain. First stretch it lightly with your hands on the work surface to form a small disk. Then you can pick it up and “pizza guy” style, use your knuckles to pull it out to about 10-12″. You should also sing the East Side Mario’s theme song while you do this. 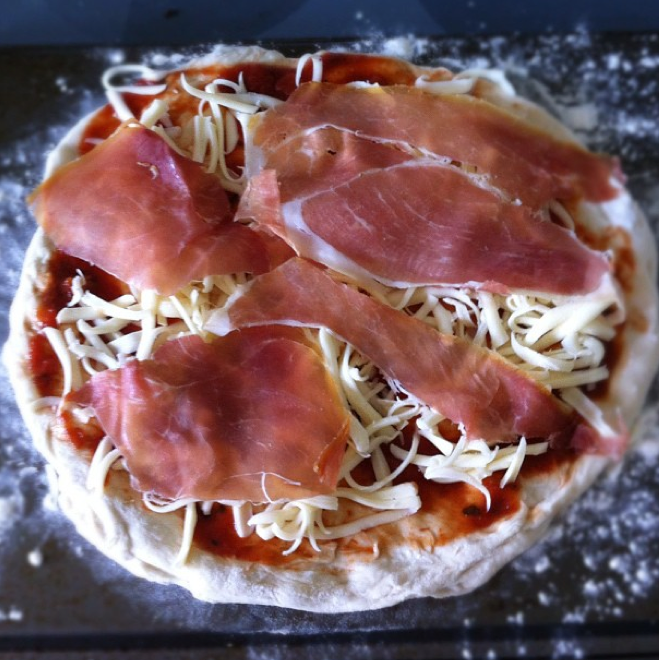 I had some tomato sauce in the fridge, a ball of mozzarella and some prosciutto. My pizza was born. Ideally you have a pizza stone in the oven that is heating up and you can slide your pizza off the peel, or off the back of your cookie sheet, onto the stone which will instantly start crisping and cooking the dough. I just put the pizza in oven on the same cold cookie sheet it started out on–and crossed my fingers. Bake 6-7 minutes. Success! I added some sweet red onion and baby kale leaves and sliced. Chewy, crispy and delicious. 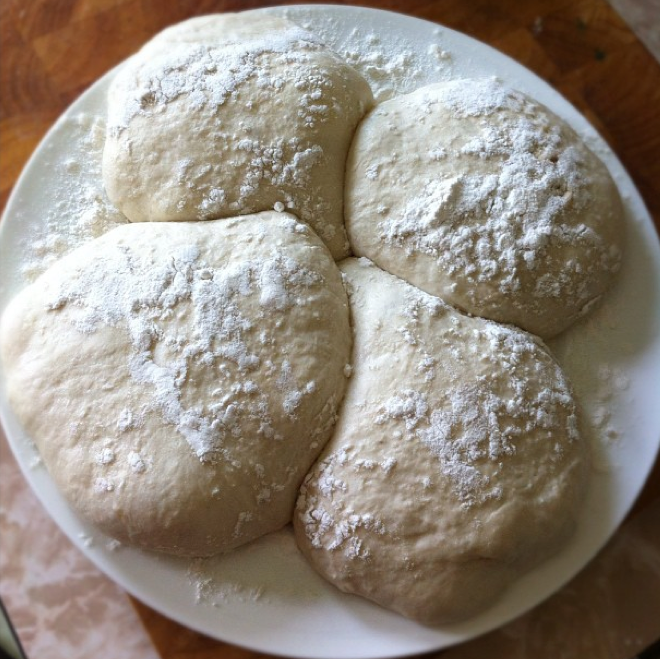 There will be no crusts left behind when you make this dough. They may even get eaten first. 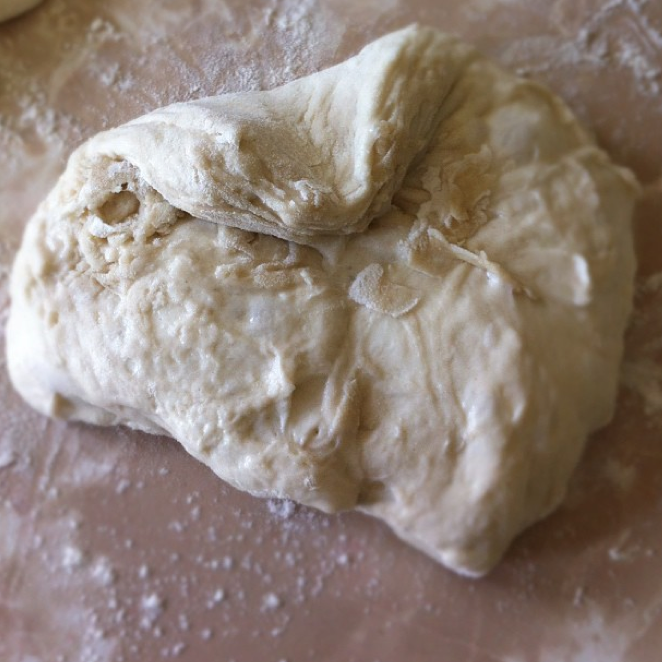 I used to have no-knead pizza dough back in college. It was called Boboli. Hi CarolAnn– safe trip and let me know if you ever try it. Next, the no knead bread. I can’t remember if you said you had made it before. Sounds amazing and looks amazing. I can’t wait to try this. It also makes sense to me that I should handle the dough gently while shaping and leave the air bubbles alone instead of crushing them like I’ve done in the past. Oh- and any issues with freezing? I can see myself wanting to make two pizzas, freeze two doughs. thank you for this reason to procrastinate from my deadline! Yes the dough is easy and really good. You’ll love it. I don’t think you can freeze it as I suspect it might kill the bubbly yeast and you’d lose the lightness. Hi Sue, I made this pizza dough recipe last night BUT a colleague told me to let it rise for only two hours… So I did that. It’s in the fridge as we speak. I’ll be rolling it out tonight. Wish me luck- will update! oh boy! What a timesaver. Let me know hot it is and I will try it too. We can compare. 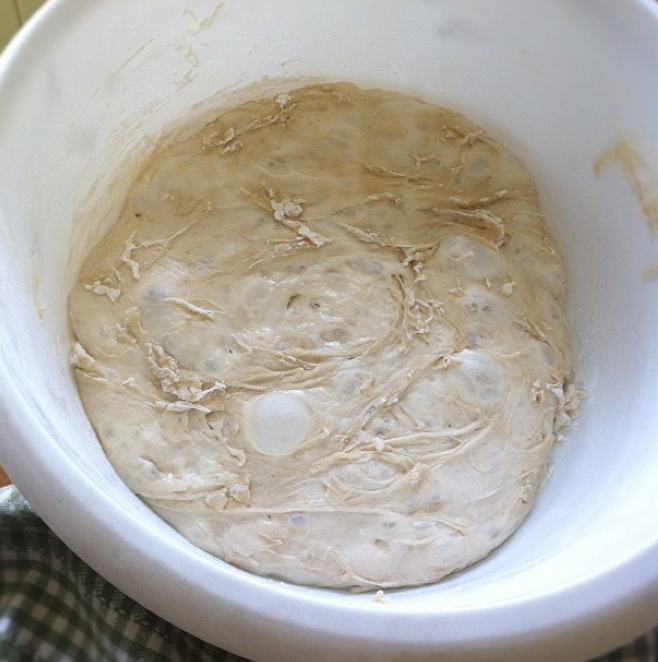 I am curious b/c I thought it was the ferment time that was key–but happy to avoid it! wait–it’s in your fridge? post rise right? Yes, it rose for just two hours. After that, fridge. It does seem to have augmented in size despite only having 2h and maybe my eyes were funny this morning but it seemed to have augmented in the fridge. I really wanted to follow your precise directives for 18h rise but my colleague said no need (knead?). I’ll have left-over saag paneer I made this week if this fails.. to be continued…and mildly freaking out.. Ignore my directives. 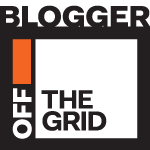 Am excited about possible breakthrough!! So far it’s hard to know what happened. I rolled it out too thin to really get flavour & texture taste bud feedback. Take two tonight with same batch of dough, this time went through a few days of freezer time. So many variables… Will be rolling it out thicker this time. I mean business! Hi-you can also just use your hands to make the pizza rounds–maybe lose less of the bubbles? Did you dough have the big air bubbles? That’s the thing I most noticed on this recipe. GOOD LUCK!! Report back!